This article is about the song. For other uses, see Baby It's You (disambiguation). "The Things I Want to Hear (Pretty Words)"
(1961) "Baby It's You" / "The Things I Want to Hear (Pretty Words)"
"Baby It's You" is a song written by Burt Bacharach (music), Luther Dixon (credited as Barney Williams), and Mack David (lyrics). It was recorded by the Shirelles and the Beatles, and became hits for both. The highest-charting version of "Baby It's You" was by the band Smith, who took the song to number five on the US charts in 1969. The song was produced by Luther Dixon. When released as a single in 1961, the song became very popular, becoming a Top 10 smash on the Pop and R&B Charts, reaching number three on the R&B chart and peaking at number eight on Billboard's Hot 100 chart. It later appeared on the album Baby It's You, named to capitalize upon the success of the single. The vocal arrangements on this version proved influential in subsequent versions, including that by the Beatles, who used the same one. One notable feature of the song is its minor-to-major key chord changes on the verses. English rock group the Beatles performed "Baby It's You" as part of their stage act from 1961 until 1963, and recorded it on February 11, 1963 for their first album, Please Please Me, along with "Boys", another song by the Shirelles. American label Vee-Jay Records included it on Introducing... The Beatles and Songs, Pictures and Stories of the Fabulous Beatles. Capitol included it on The Early Beatles. The Beatles' version differs to the Shirelles' by repeating the second verse instead of the first. A live version was released on Live at the BBC in 1994. On this version, Lennon does not repeat part of the second verse after the solo (as he did on the studio version), but repeats part of the first verse, which is the way the Shirelles sang the song. The song was issued as a CD single and a vinyl single in 1995 in both the UK and the US, the Beatles' first in nearly a decade. Both versions have four tracks, making it an EP instead of a regular issue single. The three additional tracks, while from BBC recordings, did not appear on Live at the BBC. Tracks 2 and 4 were later included on On Air – Live at the BBC Volume 2, but this recording of track 3 remains unique to this release. The single reached number seven in the UK and number 67 on the Billboard Hot 100. A live music video was released in 1994 to promote the single. It consisted of a combination of the Beatles dancing and still photographs, and was later included on a DVD or Blu-ray that comes with the 2015 release 1+. Smith's version appeared on their debut album, A Group Called Smith. The single was released on Dunhill 4206 in 1969. It was their first and most successful release. This version alters the traditional vocal arrangement as performed by the Shirelles and the Beatles in favor of a more belted, soulful vocal. The single hit #5 on the Billboard Hot 100. The Smith version was used in Quentin Tarantino's Death Proof. The Carpenters recorded a version of "Baby It's You" in 1970 for their album Close to You. Although it wasn't released as a single, it was performed on their TV series, Make Your Own Kind of Music in 1971. It was also featured on the UK compilation, Reflections in 1998 with a special remix done by Richard Carpenter in 1991. ^ Dominic, Serene (2003). Burt Bacharach, Song by Song: The Ultimate Burt Bacharach Reference for Fans. Schirmer Trade Books. p. 69. ISBN 0-8256-7280-5. ^ "The Beatles Studio <> Lyrics <> Baby It's You (live at the BBC)". thebeatles.hk. Retrieved August 22, 2017. ^ "Baby It's You". Beatlesbible.com. March 14, 2008. Retrieved August 22, 2017. 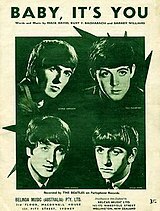 ^ "Australian-charts.com – The Beatles – Baby It's You". ARIA Top 50 Singles. Retrieved 16 May 2016. ^ "Ultratop.be – The Beatles – Baby It's You" (in Dutch). Ultratop 50. Retrieved 16 May 2016. ^ "Offizielle Deutsche Charts (24 April 1995 – 30 April 1995)". GfK Entertainment Charts. Retrieved 15 May 2016. ^ "The Irish Charts – Search Results – Baby It's You". Irish Singles Chart. Retrieved 16 May 2016. ^ "Dutchcharts.nl – The Beatles – Baby It's You" (in Dutch). Single Top 100. Retrieved 16 May 2016. ^ "Charts.nz – The Beatles – Baby It's You". Top 40 Singles. Retrieved 16 May 2016. ^ McCown, Alex (September 3, 2015). "Quentin Tarantino's least-seen flick delivers one of his best music choices". The A.V. Club. "Let Me Be Your Angel"
"Love on a Two Way Street"
"Attack of the Name Game"
"Perfect Combination" / "Heartbreak Look"